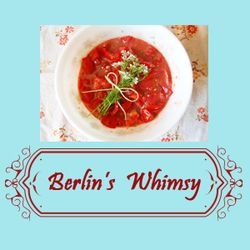 Berlin's Whimsy - Summer Savory Rhubarb Soup. Our rhubarb has reached its full glorious potential. We made rhubarb pie and I plan on making something with one of my favorite flavor combinations, strawberry & rhubarb. But the other day, I wondered about savory rhubarb recipes. That's where the May edition of Cooking Light proved quite handy. Not only did it contain a version of the recipe below but it also contained instructions about freezing rhubarb. I realize it is summer and it might be way too hot to even contemplate soup right now, but if you can stand to turn on your stove-top long enough to whip up this soup, it makes for a nice cool soup with a dollop of yogurt or creme fraiche. A lovely evening meal outside when the heat dissipates. Mix the 4 C. water with the chicken base and whisk to combine-----if you don't have this base, you can use chicken stock or just plain water. Note: I love this base because it's handy for the times I don't have homemade chicken stock in the freezer and it tastes much better than canned stock. It comes in various flavors and organic versions, too. Heat a dutch oven over medium heat and add 2 T. olive oil. Saute onion, carrot, and celery for about 4 minutes, or until a little soft. Add the rhubarb and half the parsley and continue sauteing for a bit longer. Drain lentils and add them to the pan. Add the chicken base and salt and bring to a boil. Cover, reduce heat, and simmer 25 minutes or until the lentils are tender. Cool the soup a bit and serve with a sprinkling of parsley and a dollop of yogurt, sour creme, or creme fraiche.